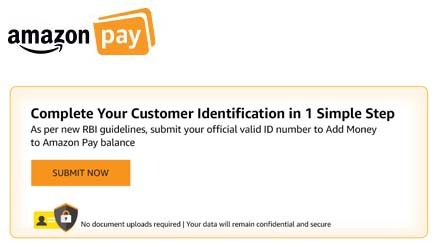 As per the Reserve Bank of India (RBI) it is now mandatory to complete your Customer Identification that is KYC to enjoy benefits of Amazon Pay Wallet. 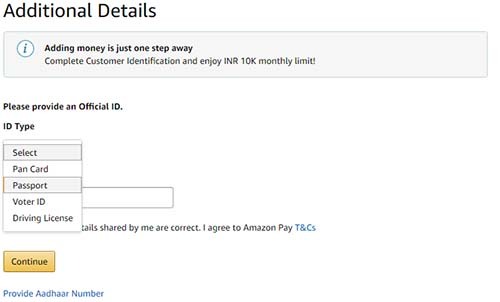 Without completing or submitting KYC details the user will not be able to use most of the features of Amazon Money Wallet like adding funds etc. The mandatory requirement to complete your customer identification KYC for Amazon Account is submitting Aadhaar Card Number, or if you don’t have Aadhaar Card than you can provide details of other official id documents like PAN Card, Passport, Voter ID, or Driving License. 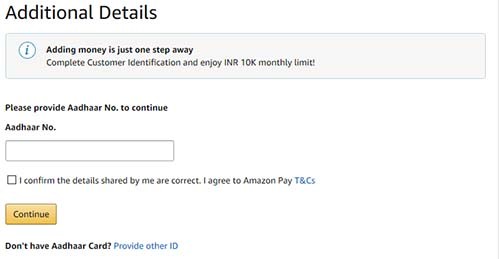 So now let’s start with the process on how to complete your customer identification KYC for Amazon Account. Visit Amazon.com or if you are planning to complete your KYC via Amazon App than open the Amazon App. Make sure you are logged in to your Amazon Account. To submit your KYC details just tap or click on Complete your customer identification in 1 simple step, if you are unable to find this banner just click or tap on Add Money and it would navigate you to form to submit your KYC details. Enter your 12 digit Aadhaar Number in the field, tick mark on “I confirm the details shared by me are correct. I agree to Amazon Pay T&Cs” and tap or click on continue button. If you don’t have Aadhaar Number than you can still complete your KYC by submitting other official id like PAN Card Number, Passport Number, Voter ID or Driving License. For that you will have to click or tap on “Don’t have Aadhaar Card? Provide other ID”. From next page select ID type from the list which you would like to provide and enter the details below in Enter ID No. Field. Tick mark on I confirm the details shared by me are correct. I agree to Amazon Pay T&Cs and click on continue button. That’s it you have successfully submitting your KYC for your Amazon Account. Now you would be able to add Amazon Pay Balance upto 10k per month.